There have been a number of different DVD releases for Sam Raimi's three classic Evil Dead films over the years, and it has become something of a chore to keep them all straight. The merits of buying whatever the latest version is generally met with questionable hemming and hawing from fans, as the arguments over particular aspect ratios and print quality were as vocal as those about extras. Anchor Bay has now issued yet another entry onto the pile, this time being the Book Of The Dead version of Raimi's 1987 Evil Dead 2, and as far as packaging is concerned it serves as a match to the Evil Dead release that also is housed in the same type of rubber-coated DVD case meant to resemble a book that has been bound with human skin. It has a weird, rubbery smell that takes some getting used to, but it is striking and geekishly cool. As the middle part of Raimi's trilogy, the action is set sometime after the events of the first film—though not exactly filled with the greatest degree of continuity—and once again features exasperated hero Ash (Bruce Campbell), and an assortment of new characters, doing battle with demons, the undead and whatever's in the cellar in a remote cabin in the woods. Raimi ramps up the pacing of Evil Dead 2, and this one thunders along like a runaway truck, with alternating doses of horror violence and slapstick comedy, giving Bruce Campbell the vehicle to paint one of the genre's most identifiable characters. By the time the third film in the series (Army Of Darkness) came out in 1993, Raimi had essentially forsaken horror for comedy, with Campbell elevating the Ash character to a string of quotable one-liners and wisecracks. Army was great on its own merits, but is so different in mood and tone from Evil Dead 2 that it is difficult to hold them up side-by-side for comparison. It is in this second installment that broad and subtle comedy got equal billing in between flying eyeballs, chainsaws-for-appendages and rogue severed limbs, and while it is a challenge to categorize this one strictly as horror, at least Raimi and Campbell go through the gory motions, even if it's for demented, unexpected laughs. There is a large fanbase for these films, as well as Campbell and the Ash character, and in Evil Dead 2 it is easy to see where the attraction comes from. Raimi's approach has been copied (or at least attempted) by countless filmmakers since 1987, because even though the effects are not always first-rate, there is a zeal and energy that is enjoyably manic. I've always thought Evil Dead 2 should be a primer of sorts for up-and-comers on how to make a horror film (even if you strip away the laughs), because it is in constant forward motion with no dead spots or unnecessary character ramblings. It's lean, fast-paced and brilliant. Image Transfer Review: In addition to the "book of the dead" packaging, the other big woo-hoo to entice the faithful is for the spanking new Sam Raimi supervised 1.85:1 anamorphic widescreen HD transfer. I honestly wasn't sure what to expect, having seen a number of different transfers for this film over the years, and I certainly wasn't anticipating the dramatic improvement that shows here. Colors are deeper and more vivid than ever before, and the whole print seems to have been juiced up somewhat to bring out more detail and to make the overall image a notch brighter. The clarity of small elements like a closeup of eyelashes or the natural hue of fleshtones combine to make this latest print look almost brand new. Audio Transfer Review: Two audio choices, available in either Dolby Digital 2.0 surround or Dolby Digital 5.1 surround. The 2.0 mix is fair but not particularly aggressive, and it really pales next to the 5.1 surround blend, which has been aurally rejiggered to fill out the rears with all sorts of undead chatter. A surprising level of directional movement is found here, too, and the spatial feel is expansive and much improved. Extras Review: The packaging is a large part of the appeal for this release, and the rubber coated case resembles the film's "book of the dead", with a handful pages featuring drawings of various demonic heads. 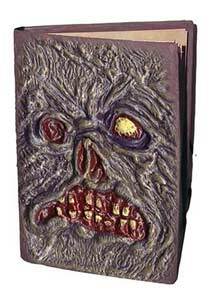 This one still has that "smell" found on the Evil Dead book edition, but it is so damn cool that I think I can live it. Plus, poke one of the eyes and the case screams. As for extras, the only real new thing here is something called Evil Dead 2: Behind The Screams (17m:06s), which is basically a narrated photo gallery by Tom Sullivan about the making of. It's a nice set of behind-the-scenes production photos, with Sullivan providing narration on what's going on. Also found here is the same laserdisc commentary track from Sam Raimi, Bruce Campbell, co-writer Scott Spiegel and special makeup effects artist Greg Nicotero, but in the annals of commentarydom it is probably one of the absolute best. Just damn brilliant stuff. Funny, informative, with Campbell in his comedic glory, which makes this track so ridiculously essential. Likewise with The Gore The Merrier (31m:50s), another repurposed short, but like the commentary it's considered a veritable fan favorite, and it's a look at the creation of the various makeup effects. An extensive Poster and Stills Gallery, a cleaned up theatrical trailer and a couple of additional trailers, and cast bios complete the supplements. The disc is cut into 24 chapters. I'll cut the gushy parade of adjectives short, and just say that Evil Dead 2 is one of the best horror films ever made. The various repackaging efforts have reached a high point with Anchor Bay's Divimax Book of the Dead version, sporting a smart new Sam Raimi-approved transfer and that great rubber-coated packaging.